Faith and Freedom Daily: A Sign For The Times? Or Heresy? A Sign For The Times? Or Heresy? The North Carolina Pastors Network has erected a large billboard sign near Claremont, NC on I-40. Lots of people see their sign every day---as the pastors knew they would. Some say the billboard---which was paid for by the pastors themselves---is a message America needs to hear---a sign for our times. The billboard pictured above says, "Why Support President Trump's Immigration Ban? 19 Muslim Immigrants killed 2977 Americans. September 11, 2001." Oliver Reitzell, who opposes the billboard, told WSOC Fox TV 8, "I believe in the Christian way and that's to embrace everybody. Kind of the hate message behind it--I'm not for that." Veteran Andrew Katocs, who served two tours in Iraq and Afghanistan, says, "That billboard, it sounds like somebody is trying to cause issues that don't need to be worried about now." I'm certain everybody is grateful for his service to our country---does he really believe that? The Pastors Network has the support of about 600 pastors across the state. One of the network pastors told TV 8, "I'm saying it now, that this is not what this is about. There's certainly nothing hateful in our billboard. Some have interpreted it to be that way and say that. It was not. It is the truth." David Kistler, who heads up the group, believes if the terrorists behind the 9/11 attack had converted to Christianity, the attack wouldn't have happened. He says, "This isn't about hate. The issue we're trying to make is the problem with Islam and its ideology." 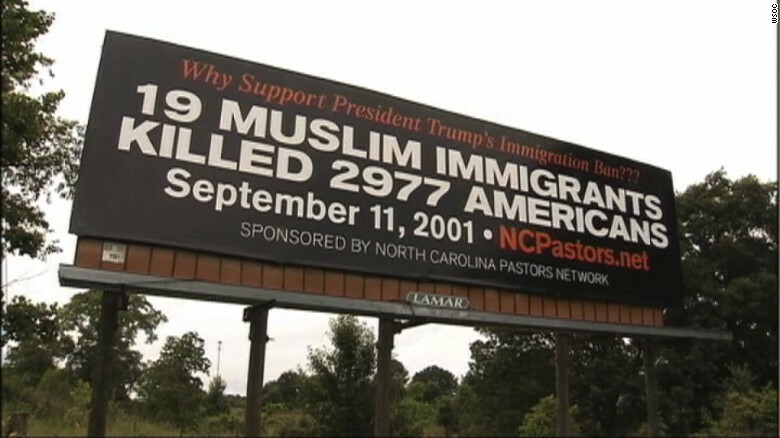 But WGN TV 9 in Chicago makes the point in their reporting, "The billboard seems to stress that Muslims are to blame for the 2,977 lives lost on 9/11. It doesn't mention that at least 32 innocent Muslims also lost their lives on 9/11." What TV 9 misses is that these pastors are not talking about moral equivalence, they're talking about protecting themselves and others from terrorists willing and anxious to die in doing so. Nowhere do these pastors suggest that all Muslims are terrorists. Paul Cummings, an associate pastor with the Corinth Reformed Church in Hickory, NC, believes the billboard contradicts teachings from the Bible. He says, "My opinion is that these people need the saving gospel of Jesus more than I need to be protected. I'm perfectly willing for people who are hostile to us, to be in our country, because that's what loving your enemy is all about." Is "loving your enemy" all about removing the borders from a sovereign nation and inviting any and all who seek to destroy us to have at it? Dr. Alex McFarland, a noted Christian apologist, and educator says, "Christianity doesn't mandate that America has irresponsible open borders policies"---and he a argues that those who advocate for such don't know what they're talking about. He says, "Those who play the Christian card and say it's unloving to have consistent, responsible immigration policies; [those who say] it's un-Christian to vet out potential terrorists and those who would migrate here from terrorist nations---they don't understand theology or politics." McFarland says, "The terrorists hate America because we've sided with Israel so often They hate America because they believe we're infidels. They want us dead." "I thank God for our president who said either we have a country or we don't," he said. The heresy lies with the religious Left---and their strong advocate for open borders. Jim Wallace and other leaders of the Religious Left have misled well-intentioned Christians. The Scriptures make it clear that national sovereignty, including clearly defined borders, is God's idea. In Acts 17:26 we read, "And He made from one man every nation of mankind to live on all the face of the earth, having determined allotted periods and the boundaries of their dwelling places..."
We are told two things are under God's sovereign control in this regard---how long a nation lasts, and where its borders are. The verb translated "having determined" is the Greek verb "horizo" from which we get the word "horizon." It means to "to mark out or define." So God has marked out and defined the borders of each country. My friend Bryan Fischer has written an excellent article on "The Bible and Borders" giving a full, but concise account of what the Bible actually teaches on national borders. I strongly recommend you read it. Fischer says the bottom line is that "borders are biblical, and are there by God's sovereign design. And they are to be respected by everyone." Freedom of speech only applies if they agree with what you say, otherwise you are engaging in hate speech. Please note - Our president has no authority over anyone's ability to travel, they only have authority over who is allowed into the US. Anyone can travel as they wish otherwise so we have criteria for entry to the USA, no travel ban! sad that some people do not understand the need to protect this country from the horror that is taking place around the world. Every single nation that has invited Migrants , not ISIS but the people displaced by ISIS has been attacked repeatedly by ISIS They have destroyed the history and relics that are irreplaceable across the globe and looking at the USA the same is happening as we watch our precious relics and statues taken away one by one and our history rewritten. Most not even taught in school anymore. While Christianity is banned from our lessons The Kuran is taught even in the most rural places. Thank God for pastors like this that have banned together and are fighting for the innocent who have no idea the evil they are trying to let in to this country. We fight this fight together my brothers and sisters and with Gods direction and his constant love we will win. This the last safe place for Christians on earth must win our place in the world we once were. America truly has been and hopefully can continue to be a "melting pot" culture for those in the world who wish to benefit from her values and assimilate to her culture. Those who refuse to assimilate and join/defend America will only serve to break down our culture and generate division and ultimately confrontation. Still others are required by their religion "not" to assimilate into America's culture, The latter is Islam. The Koran prohibits assimilation into any culture that is not in compliance with Sharia, and Sharia is fundamentally opposed to the liberty, freedom, and a rule of law based on the Bible which makes America great. There is no option for an obedient Muslim to assimilate. To understand this is to simply face the monster of political correctness with truth. We can and should pray for those individuals, both Muslim and others, who face intimidation and violent repercussions for opposing the implementation of Sharia in America.